Recently we discussed how to customize the offers for subscribers and non-subscribers by leveraging on a web technology called Cookie. Today I am going to show you how you can customize based on different WordPress pages, posts or categories. The former is customization based on audience. The latter is customization based on content. Why Customize Based On Content? Imagine when a visitor comes to your blog to read an article about SEO, which offer will appeal to this visitor more? Apparently the answer is 1. 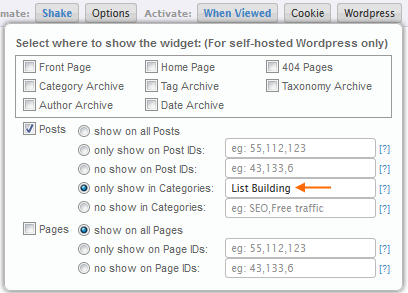 But another visitor may come to your blog to read an article about list building. Which offer do you think will appeal to this visitor then? It’s common sense that if you can present a more relevant offer to your traffic, you can significantly increase the conversion rate on your website. The question is, how do you make such a customization? Customization is very easy with the new feature we’ve just added to the PopupXpert. For those who are new to our system, PopupXpert is a free widget generator that allows you to create all kinds of animated widgets, from popups to onpage banners and opt-in forms. Go to PopupXpert now. If you have used it previously, you will notice a few changes. 1) The animation settings, which were initially in a panel floating on the left, are now positioned in a top Setting Bar. This frees up the design space, giving you a better visual when designing the widget. 2) The widget editor, which was initially at the right, is now aligned to the left and can be hidden. Again, this is mean to free up the design space. 3) Text editing for text and link elements are now changed to a WYSIWYG editor for ease of editing. 4) Last but not least, a new button called ‘WordPress‘ has been added. This is the new feature that allows you to customize where on your WordPress blog you want to show a particular offer. For example, say you have 3 offers (i.e. 3 widgets). – One offer targets visitors in the SEO, SEM and Link Building category. – Another offer targets visitors in the List Building category. – The last offer targets visitors in the rest of your blog. Remark: Basically you uncheck all the options except the Posts option (see arrow 1). 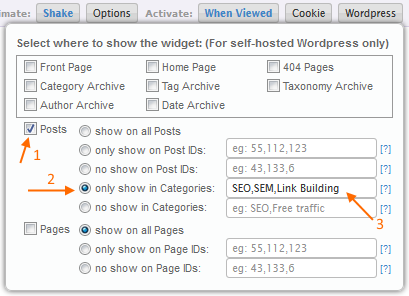 Under the Posts option, you select ‘Only show in Categories’ (see arrow 2) and enter the category names ‘SEO,SEM,Link Building’ (see arrow 3). One thing to note is the category name MUST match the category name in your WordPress exactly, including the case. Remark: Similarly, you uncheck all the options except the Posts option. Under the Posts option, select ‘Only show in Categories’ and enter the category names ‘List Building’. Remark: The last offer is shown to all other visitors in your blog. This means you want to include every part of the blog except traffic in the 4 categories ‘SEO, SEM, Link Building and List Building’. To do so, you check all the options. Then under the Post option, select ‘no show in Categories’ (see arrow 1) and enter ‘SEO,SEM,Link Building,List Building’ (see arrow 2). That’s all. Generate the plugin and add it your blog. 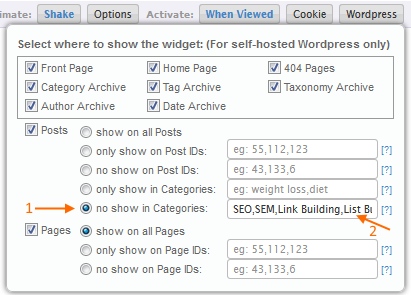 The system will automatically show the intended widget on the intended pages. Note: If you have previously used PopupXpert on your blog, you will need to update the plugin for this new feature to work. Check your plugin version. It has to be at least version 2.0. The illustration above shows you how to customize the offers based on the category. You can also do customization based on Post ID, Page ID, Home Page, and the various classifications available in WordPress. You can also combine it with cookie setting (see arrow below) so that you can customize based on both audience and content. I hope you like the new features we’ve added. Let me know what you think in the comments below. Great blog Kenneth. Lots of information on how to get the best benefit from the tool. Will follow up after I have used it. I found it useful.. thanks for created this. Nowadays Pop-Ups are really important for list building and market is very bullish about it. this website has paved the way to easy traffic. i have got enough traffic for steam wallet games. and my other website running for facebook password hack is also doing well. thank you so much , just amazing. I found this as an informative post. Thank you for letting us know how we can customize our offers based on different WordPress pages, posts or categories. I am glad to read how I can customize my offers based on different WordPress pages, Posts or Categories. Your ideas have been of great help to me and I highly appreciate for that. I am only a beginner to these things and there are a lot of things that I have to learn. Your website have helped me in learning a lot about these things and I don’t know how to thank you for that. Your website has helped me a lot in learning these things. I was only a beginner and I learned many things from your website. I don’t know how to thank you for all that. Thanks for sharing these tips on your website. Keep posting more.